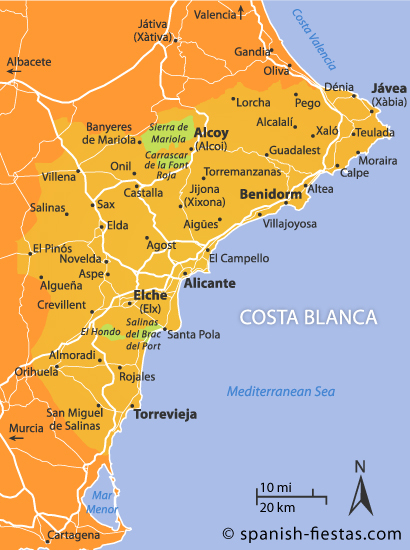 Costa Blanca is in the province of Alicante. It consists of around 200 km of Mediterranean coastline though its borders aren’t strictly defined. To the north it includes the popular resorts of Gandia, Javea and Denia and to the south it extends to the rather ugly development of Torrevieja. Around here marks the beginning of the Costa Calida. A number of other smallish resorts such as Moraira, Altea and Calpe are particularly popular with Spanish tourists. In contrast the high rise resort of Benidorm is one of the world’s most popular package holiday destinations. The weather on the Costa Blanca is what you would expect from a well visited tourist resort on the Mediterranean, lots of sun and little rain. It has been quoted by the World Health Organisation as being one of the healthiest climates in the world with more than 300 days of sunshine per year. Winter is mild with temperatures during the day rarely falling below about 10ºC although it may get a bit chilly in the evenings once the sun has set but during the day you may be lucky enough to find a sheltered spot to do some sunbathing. Summer temperatures generally reach at least 30ºC but sometimes climb as high as 40ºC and even in the evenings they don’t fall very much. The climate on the Costa Blanca is generally dry especially during the summer but there can be some rainy days in autumn and winter with September and October being the wettest months. However, the rain seldom lasts for long before the sun reappears. Such a climate means that you can really enjoy the outdoor life both in summer and winter and is great for playing golf on one of the region’s many golf courses. Altea – Altea is one of the most beautiful towns on the Costa Blanca. The beach is pebbly unlike most of the resorts but this has prevented mass tourism and it has a charm that makes it well worth a visit. Benidorm – Until the 1960s Benidorm was a sleepy fishing village yet today it is Europe’s largest holiday resort which attracts around 5 million annual visitors. Calpe – Dominated by the huge rock called the Peñon de Ifach, Calpe is probably the most built up resort on the Costa Blanca other than Benidrom. It has some Roman ruins and salt flats that attract a wide range of birds. Denia – Denia is located between Gandia and Javea on the northern Costa Blanca. Just outside the town it has a long, golden sandy beach which is remarkably underdeveloped. Regular ferry services connect Denia with Ibiza in around 2½ hours. Gandia – Gandia is the most northerly resort on the Costa Blanca. It caters for predominantly Spanish tourists but the beaches are fantastic and well worth a visit. Javea – Javea is one of the most popular resorts of the Costa Blanca. It has an interesting old town, a busy marina area and the lovely, sandy beach of El Arenal. If you visit in summer look out for the Javea Festivals. Moraira – Moraira is a real jewel of the Costa Blanca. Located just south of Javea it has stylish cafes and restaurants and a small, sandy beach just next to its very small “castle”. Below you’ll find a list of all the main resorts on the Costa Blanca with links to some of the best value hotels as provided by Booking.com. Alicante will most likely be your arrival point when visiting the Costa Blanca. Most visitors head straight for one of the resorts listed on this page but if you fancy a night in the city there are plenty hotels available. Altea is one of the prettiest towns on the Costa Blanca lying just north of Benidorm. It has a stylish marina and lively promenade as well as some beautiful places to stay. Benidorm is the number one resort on the Costa Blanca with enough attractions to amuse everyone. There is an immense selection of properties to suit all budgets and tastes. Calpe is well equipped for large scale tourism with only Benidorm on the Costa Blanca having more high rise developments. There are plenty properties with easy access to the resort’s fine beaches. Denia is an attractive resort with a fascinating old town, some fine restaurants and excellent blue flag beaches. There’s a good selection of accommodation on offer. Javea is a most attractive destination on the northern Costa Blanca and has long been a favourite of north Europeans. A good selection of hotels provide access to the resort’s excellent beaches. Benidorm is by far the biggest resort on the Costa Blanca which attracts visitors of all ages. The resort boasts three blue flag beaches, lively nightlife to suit everyone and some very good restaurants. On the outskirts of town are some world class Benidorm theme parks which can easily be reached from the ‘Autopista AP-7’ which runs the full length of the Costa Blanca. There are Costa Blanca Markets which take place on different days along the coast and from most resorts you’ll be able to book boat trips that take you along the Costa Blanca. Another novelty is to take a trip on the tram which runs up and down the coast between Alicante and Denia with many stops in between. If you have a rental car and fancy escaping from the beach for a day then there’s a treat waiting for you in the beautiful countryside inland from the Costa Blanca. Here you’ll find one of Spain’s great undiscovered gems which is growing in popularity with walkers, cyclists, birdwatchers and nature lovers in general. In the off season it’s well worth stopping off at the lovely town of Guadalest though the place is overrun with tourists during the peak season. A lovely spot for lunch is at one of the seafront restaurants in the quaint fishing community of Villajoyosa just south of Benidorm. As you travel along the Costa Blanca you’ll come across quite a selection of holiday resorts each with their own particular flavour. Whilst Benidorm is Europe’s biggest resort with over 5 million annual visitors there are some quite contrasting destinations which are conducive to more laid back holidays. Many visitors to Benidorm prefer to book package deals but there are some lovely places along the coast where you can find a fine selection of villas and apartments to rent. In the very north of the Costa Blanca you’ll find a fine selection of holiday rental options in the pretty resorts of Gandia, Javea and Denia. For really relaxing destinations with private accommodation available it’s worth looking at the smaller resorts of Moraira, Altea and Calpe further south. It is possible to take boat trips from many of the resorts on the Costa Blanca. You can take a “mini cruise” between the harbours of Denia, Javea, Calpe and Altea either for the pleasure of being on a boat or to avoid the traffic on the roads between these resorts which can be fairly heavy in the summer months. The view of the Costa Blanca from the sea is spectacular and gives you a different perspective than being on land, especially of the church at the top of the hill in Altea, the castle in Denia, the Peñon de Ifach (large Gibraltaresque rock) in Calpe and the Parador in Javea. You can also take a sailing trip along the coast on a catamaran viewing the rugged landscape of the Costa Blanca and have time for swimming, snorkelling and sunbathing along the way. There are trips to watch the sunset from the sea, beach party cruises and trips in glass bottom boats. There are a few companies offering a selection of these types of boat trips. One company that we liked is Mundo Marino. For more information on what they have to offer take a look at there website: www.mundomarino.es which does have an English version although some of it is not yet translated. There’s a narrow gauge rail network which runs along the Costa Blanca from Alicante to Denia It is officially known as the FGV (Ferrocarril de la Generalitat Valenciana). There are stops at Terra Mitica in Benidorm, Altea, Calpe and Teulada (near Moraira) along the way. It also stops at many other stations meaning that it takes quite a long time to cover the route. There are trains departing from Alicante-Luceros station every hour. It’s probably not the best method of travelling the whole way from Alicante to Denia but it could be used between Benidorm and Denia or any of the stations in between as a short excursion. For more information and an up to date timetable and prices take a look at the TRAM website.